Amazon said Thursday that its takeover of Whole Foods (WFM) will close on Monday, and its first order of business will be to make some items more affordable, according to a release. "Whole Foods Market will offer lower prices starting Monday on a selection of best-selling grocery staples across its stores, with more to come," the company said in a statement. Items that will be marked down on Monday include organic avocados, organic brown eggs, organic salmon, almond butter, organic apples and organic rotisserie chicken. Amazon said it'll keep the markdowns coming, and that Amazon Prime members will get additional discounts at Whole Foods. "Everybody should be able to eat Whole Foods Market quality -- we will lower prices without compromising Whole Foods Market's long-held commitment to the highest standards," Jeff Wilke, CEO of Amazon Worldwide Consumer, said in a statement. That's good news for Whole Foods critics, who have long bemoaned the grocery store's high prices. Its prices even sparked a legal controversy in 2015 when New York City's Department of Consumer Affairs accused Whole Foods of "systematic overcharging for pre-packaged foods," like sliced fruit and sandwiches. The chain paid $500,000 in fines to settle the matter. The city's inspectors called it the worst case of mislabeling they had seen in their careers. And there was more bad press when a photograph of a $6 bottle of "asparagus water" at a California store went viral. The beverage appeared to contain nothing but several asparagus stalks soaking in water. Whole Foods later pulled the beverage and said it was prepared incorrectly. The segment featured parody ads for items including tilapia wearing yoga pants for $84.99, a pomegranate listening to NPR for $64.99 and a block of ice with an avocado balanced on top for $25.99. -- Amazon lockers -- where customers can pick up or send back items purchased on Amazon.com -- will pop up in "select" Whole Foods stores. 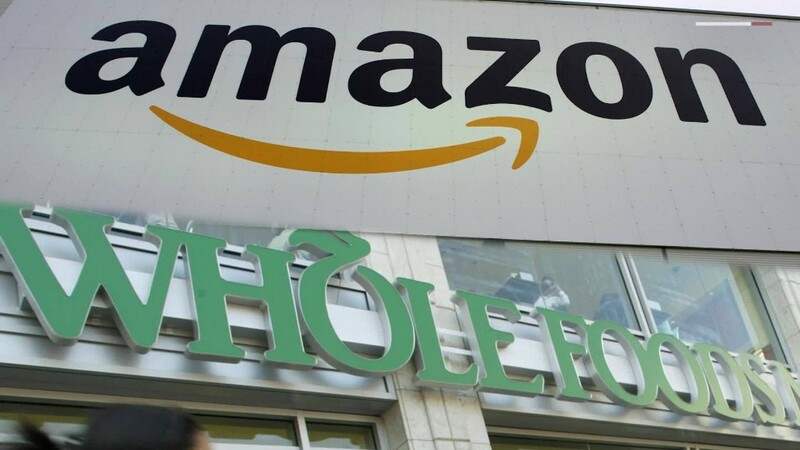 -- Whole Foods-brand products will now be available through Amazon.com and other Prime platforms, such as Prime Now, the same-day delivery service available in some markets. The store's brands include the Whole Foods label, 365, Whole Paws and Whole Catch. --CNNMoney's Patrick Gillespie and Paul La Monica contributed to this report.